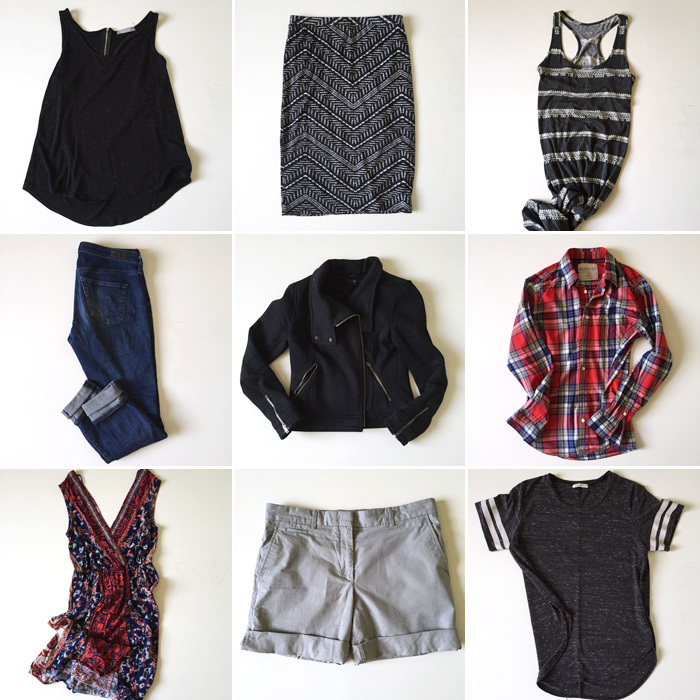 A couple weeks ago Merrick wrote a post about finding your personal style. As I read through I was like, "Whoa, I REALLY needed this!" Picking out my top 10 items was super eye-opening. Apparently I like black, gray and an occasional splash of red. I have a thing for pieces that are either menswear-inspired (boyfriend shorts, moto jacket, track tee) or actual menswear (plaid button down). I like things that are loose around my midsection (I'm a middle figure so that's where I gain and carry weight) but highlight my thinner arms and legs. I love a little bit of edgy hardware, like the exposed zippers on the moto jacket and black tank. Honestly, looking at those 9 items makes me go, "Yup, I could live with just those." That right there is my comfort zone. Merrick also talks about picking things that work for your lifestyle and where you live. I used to LOVE heels but now I couldn't tell you the last time I wore a pair. They were fun when I only left my house on occasion but now I'm totally the taxi driver mom carting kids from A to B to C to... and I just want to wear flats and sandals. They're practical for where I'm at in my life! Also, I own a strangely winter-friendly wardrobe considering Mesa's winter lasts for 30 seconds. I need more tank tops and tees and I should probably stop buying jackets. Have you assessed YOUR style lately? How would you define it? What are your top 10 items? When Aaron and I first got married I didn't know how to cook. Like...at all. The 3 cookbooks I got for our wedding and a handful of hand-me-down recipes from my mom were all I had to plan our meals. It's mind-boggling how different the internet is now versus ten years ago. Cooking blogs weren't really a thing when I first got married. In fact, I hardly used the internet at all (except to e-mail Janssen). Now Google is practically an extension of my body and almost ALL my recipes are from cooking blogs. Except for this one. There are very few recipes that I made in our first year of marriage that I still make today and this is one of them. It's quick, easily doubles, and reheats beautifully. My kids eat it, Aaron often requests it, and we've served it to company on more than one occasion. It's solid and I'm sure we'll still be eating it in another 10 years! Cut chicken into 3/4 inch cubes. Stir cornstarch into 2 tablespoons white cooking wine and mix well with chicken cubes. Set aside. Remove root ends any wilty parts from the green onions. Rinse and slice into 1/8 inch pieces. Peel ginger, slice thinly and then slice into matchsticks. Break up or chop cashews (I throw them into my small food processor and pulse a few times). Heat oil in a wok or pan, add cashews and stir-fry for 1-2 minutes until golden (watch them closely so they don't burn!). Remove with a slotted spoon and set aside. Add chicken to the pan and stir-fry for a couple minutes until most of the pink is gone. Add onions and ginger and stir-fry for one minute. Combine remaining soy sauce, white cooking wine and about 1/3 cup water and add to chicken. Cook until chicken is no longer pink. Add cashews back in. If it's too watery (mine is occasionally), mix a little cornstarch in water and stir in to thicken. 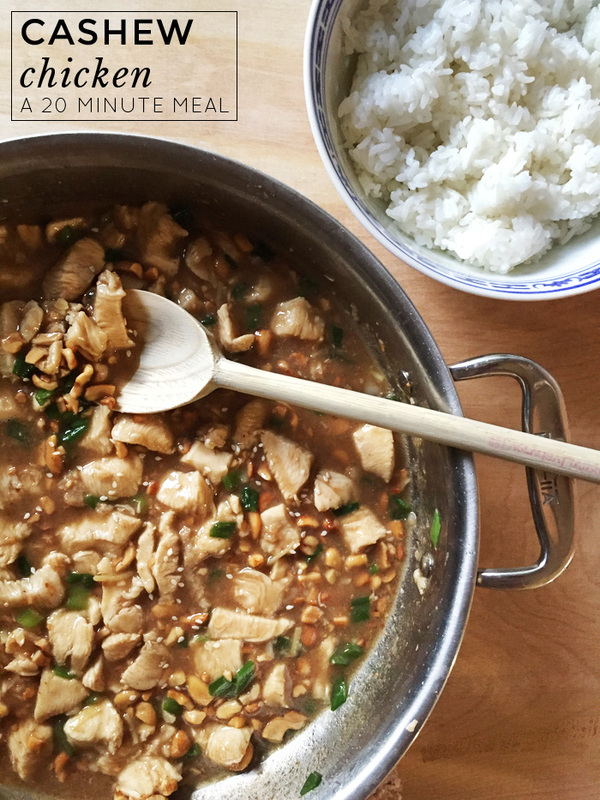 Looking for more quick and easy recipes? Check out this balsamic chicken with pasta and fresh cheese or these Santa Fe veggie wraps (no heat required)! See more of my favorite recipes on Pinterest! For my 30th birthday I decided I wanted to go to Disneyland without kids. I love those little monsters but I really needed a break. The timing didn't work out for me to go until this past weekend so it was a rather belated birthday gift to myself. I left Thursday evening. My friend Elisa teaches elementary school in Alaska but she's visiting her mom in Phoenix for the summer so I picked her up on my way over to California. My uncle lives in LA but was going to be out of town so he offered his place for us to crash for the 3 nights we were there. Fortunate occurrence number 1: During the drive I warned Elisa that the parking situation around my uncle's apartment is abysmal and we would probably end up getting in after midnight and then having to park 17 blocks away and hike over. When we arrived at almost 1am, however, there was a spot about 20 steps from his door. We kept reading the signs to make sure my van wouldn't get towed but, sure enough, it was legal to park there. The next night that EXACT SAME SPOT was open at midnight as we rolled in after our first day at Disney. Even on the third night we only had to park around the corner. We've been visiting my uncle in that same apartment for YEARS and that has literally never happened. 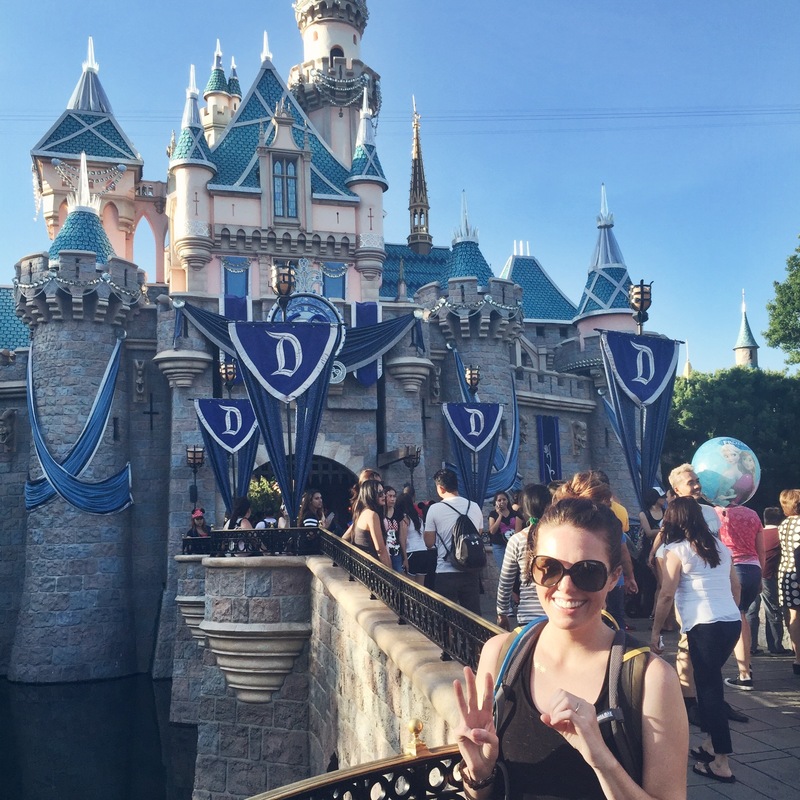 Fortunate occurrence number 2: Since we went on a summer weekend the parks were predictably crowded. We decided to do the single rider line for Indiana Jones to avoid waiting 50+ minutes. We got through in under 10 minutes and somehow still managed to sit together. These cost $23. I'll let you figure out whether or not I bought them. Fortunate occurrence number 3: Day two was a Saturday and we could tell just from the traffic getting into the parking garage that it was going to be crazy. The lines to get on the shuttle were long. The lines to get through security were insane. When we finally got through to the park gates I opened my backpack to get my wallet...and it wasn't there. Elisa suggested we file a lost and found report, just in case. And maybe, since we had been there the day before, they would have my information on file and could issue me a new ticket. I felt silly filing a report for something I suspected was on the dresser in my uncle's room but I did it. The lost and found guy was fantastic. He took the report and issued me a new ticket so I could at least get in to the parks. Elisa said she'd spot me any money I needed and very quickly our day was back on track. Less than two hours later I had a voicemail from Disneyland. THEY FOUND MY WALLET. I somehow managed to lose it at Disneyland the previous evening and someone turned it in. We went back to the lost and found office and I did a quick check- everything was still there. Not a single thing was missing. A very merry (un)birthday to me! she's probably going to ask for a glass of water. she'll likely request a pitcher of water for the table because she's the thirsty type. When she's finished with dinner, she'll go to the bathroom. Then she'll jump in the back seat of the car with her friend to chat for the 35 minute drive home. About 20 minutes in, she might realize she needs to pee again. She'll think she can hold it for 15 more minutes. When she realizes she can't because baby number 3 decimated her bladder, she'll awkwardly ask you to pull over. She'll run off into the desert. She'll pee in the desert before God, the moon and some very understanding friends. When she's mid-pee she may realize that she's stepping on a cactus. 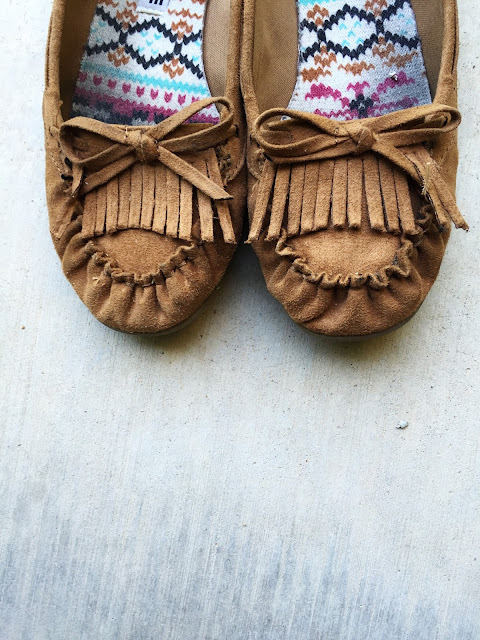 While extricating herself she'll accidentally pee a little on her favorite moccasins. When she gets back to the car she might realize that her shoes are also covered in cactus spines. She'll take off her pee and cactus encrusted moccasins only to discover that her foot has some cactus spines as well. She'll probably ask you to just take her home. When she gets home and removes all the cactus spines she'll feel much better. The next morning she'll take a closer look at her favorite moccasins and realize they are ruined but she can't bear to throw them away. She'll stick them on the back patio and feel sad. Because you love her, you'll get her a glass of water. you should probably take her to dinner. (She'll have to wear different shoes, though). I've done very little sewing for myself over the past couple years. Between pregnancy, moving, and having a tiny baby around I just haven't had the motivation! Life (and my waistline) finally seem to be settling though so when I found this kelly green linen at SAS I knew something for myself was in order. It had been a while since I used my favorite pencil skirt pattern* so I dug it up and got cutting (and then re-cutting when I realized my hips are like 2 inches wider than they were a few years ago. Ahem). The whole thing came together beautifully. If I were to do it again I probably wouldn't use linen (it's a little too wrinkle-prone for a skirt with this kind of detail) but it was sure nice to sew with. I used white satin as my lining, which I always love for the slippy-slidey factor. 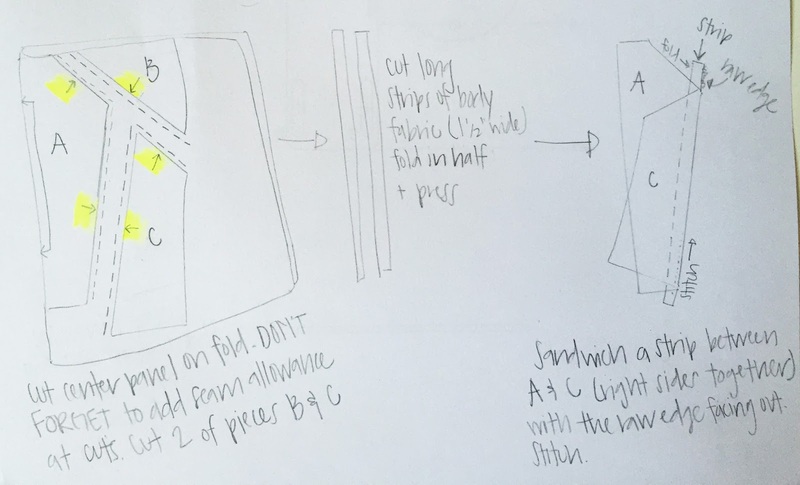 I spent over an hour trying to make a pretty Illustrator graphic for how to make this skirt front but came away hating everything and thinking that Illustrator is the stupidest program ever. Then I spent 10 minutes drawing you this diagram using pencil and paper. You'll need a pencil skirt pattern of some sort. 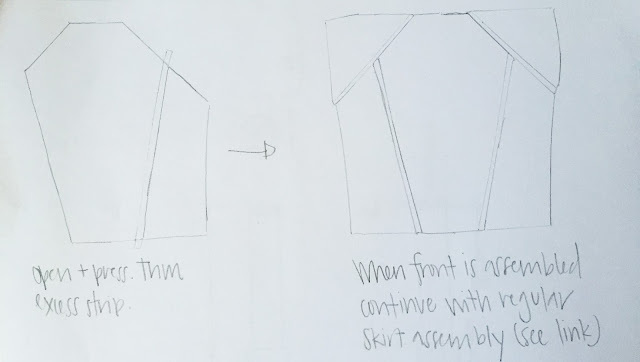 I'd imagine this would also work fairly well with jersey, if you're wanting more of a stretchy tube skirt kind of deal (aaand now that I've typed that, I really want to make one). 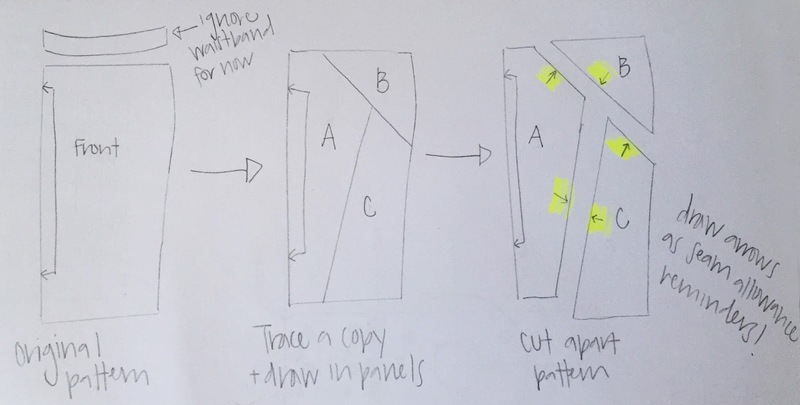 You'll just be messing with the front pattern piece. Click to enlarge any of these. I know my writing can be hard to read! Also, on the last bit I forgot to explain that you repeat with each panel- sandwich a folded strip between the center piece and a side panel piece, stitch, then open and press. Start with the lower panels and then do the uppers. Once your front piece is all assembled you can finish the skirt assembly according to your pattern. I totally recommend this tutorial for inserting a zipper with a facing or lining! I had a gold zipper in mind but all I had on hand was this turquoise one. I don't hate it. Thanks to Photography Hill for capturing my backside in such a lovely fashion. *I just clicked over to the original tutorial for the first time in yeeears and apparently it's no longer there. This tutorial looks promising, however. 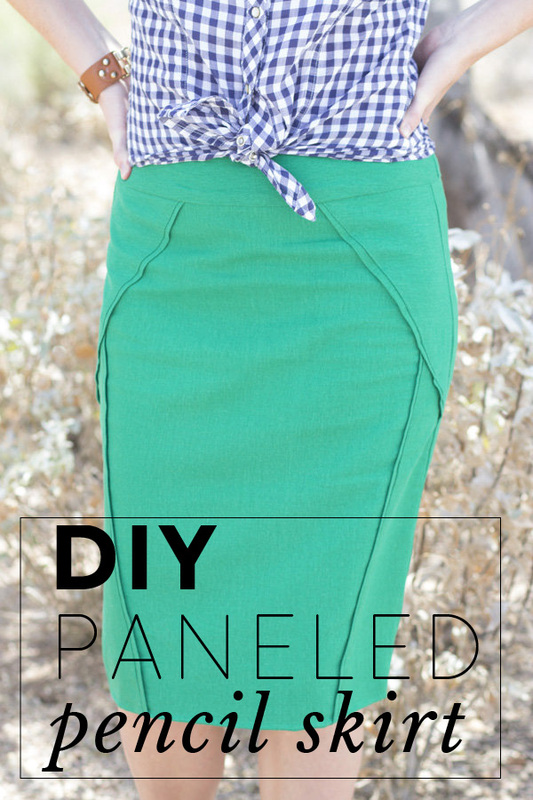 You can always use a store-bought pattern or try Googling "pencil skirt block" and see what you find. To make a lining I use the same pattern in my lining fabric (minus any embellishments). Basically, you're making the same skirt twice then putting them together at the waistline and zipper then hemming them together. Like this post? You may enjoy some of my other tutorials, like this watercolor dress tutorial or perhaps this dip-dye skirt-turned-dress. I've had a lot of conversations about blogging lately with fellow bloggers. I've been blogging for almost 9 years and it has changed a LOT since I first registered for a Blogspot account in 2006. I know plenty of people are ready to declare it dead or dying at the hands of social media but I don't think that's the case. It's evolving, sure, but there is still a place for blogs out there! 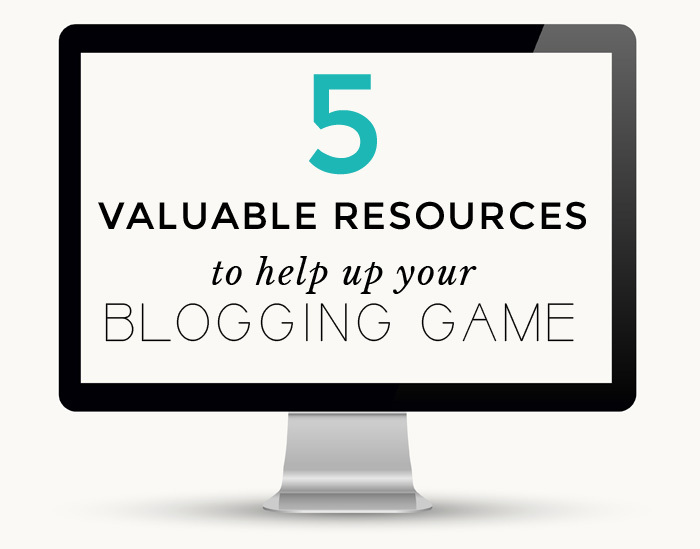 If you're super late to the blogging train or feel like your blog has been dragging a bit (ahem, meeee) I've rounded up these 5 valuable resources to help you up your blogging game! 1. Not getting enough sponsored content? Sponsored posts aren't for everybody but they DO help pay the bills (also, I recommend you check out Grace's and Janssen's blogs for examples of how to do sponsored content well). If you've signed up for a blogger network or two and feel like you're not getting enough opportunities that fit your blog and readership, check out Megan's Ultimate List of Blogger Networks and Media Companies. There are WAY more than I ever realized and there's something for everyone. Find a network or two that fits YOU and work from there. 2. Struggling to put together a media kit? Check out this free template download from Recipe Tin Eats. It may not be your forever media kit but it'll get you started. I never used to get asked for mine but lately I've gotten quite a few emails from companies interested in collaborating who want to see my media kit (which is awful and crazy outdated...oops). I suspect that, in general, potential sponsors are more interested in seeing hard numbers these days rather than just going off what they see on your homepage. 3. Need images you can legally use for posts and social media? Check out GraphicStock. You can get a 7 day free trial (if you don't want the membership make sure you cancel at the end) or $99 for an annual membership. I'm using the free trial right now to update a bunch of old posts that have sad, awful photos. You can still get a lot of mileage out of old posts thanks to social media, so refreshing your older content is worth your while. Plus, as someone who takes 99% of her own photos, I'm sort of dying over how easy it is to grab stock photos for header images. 4. Feeling like you need to improve your writing? I loved this list of 317 Power Words That'll Instantly Make You a Better Writer. I LOVE vocabulary words but still sometimes get stuck in a writing rut...especially because my blog is fairly conversational. I use "like" and "just" waaaay more than I should and I know it weakens my writing. That post is a great reminder that I need to be thinking more carefully about my word choice. 5. Want to know how others are making it? Did you know that some bloggers publish their income reports? It's crazy eye-opening. YMF published their May 2015 income report and it's mind-boggling, to say the least. Looking through that post helped me reassess some of the things I'm doing (and not doing #lazy). I think it's absolutely acceptable to want to make money for the time you invest in blogging but it can be really hard to figure out how to make that happen in a way that doesn't feel like selling out. Seeing how others are doing it is super helpful. Have you seen any really great blogging related resources lately? SHARE. I'm really trying to up MY game again (look at me! Posting regularly!) and I love talking about blogging. I am a super light packer (in the past I have referred to myself as a "packing ninja" and I stand by that). 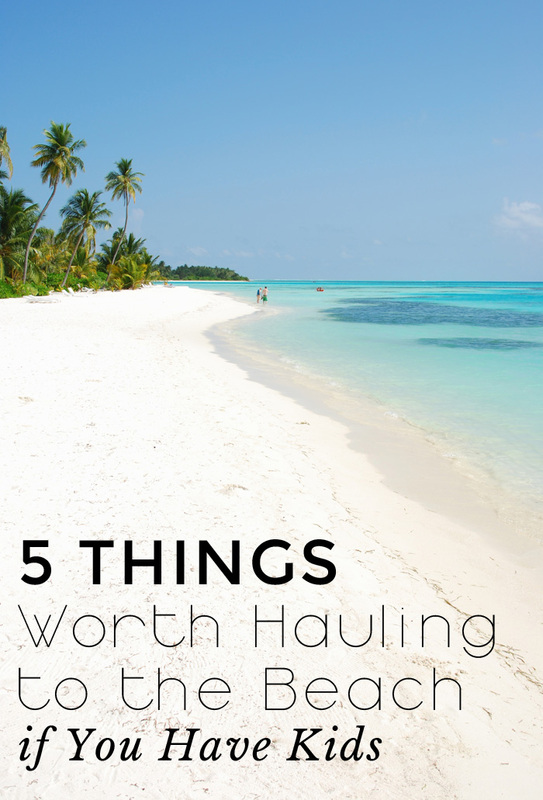 I do not want to haul anything on a trip with me that is not completely and totally necessary. I HATE dragging heavy, overloaded bags around so you know if I bothered to bring something on a trip with me then it was worth the suitcase space. Stinky is a solid swimmer at this point but Baby 2 is still learning. 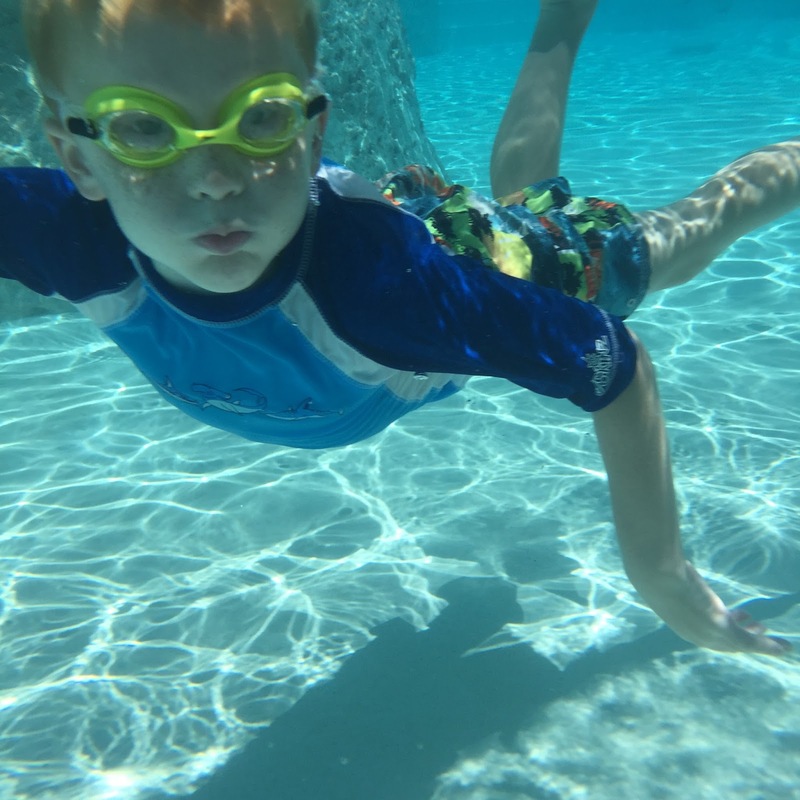 He CAN swim but outside of swimming lessons he tends to forget the things he's learned and I was worried how he'd do when faced with waves or the not-so-lazy river at Aquaventure at Atlantis. I scored this Puddle Jumper flotation device (they're Coast Guard approved, btw, so your kiddos can wear them while boating and whatnot) at Costco for cheap and told him that I wanted him to practice his swimming as much as possible but if he got tired or if there was water I didn't think he could handle, we'd put on his floaties. It was a great arrangement and these gave him the courage to do some of the slides and other attractions he (and I) probably would have been too nervous about otherwise. I have a very conflicted relationship with sunscreen. On the one hand, we are a super fair family with a long history of skin cancer so obviously we should be dipped in sunscreen every hour on the hour. On the other hand, chemicals. A couple readers told me about Blue Lizard and I have been so ridiculously happy with it. It's free of a lot of the scary junk in other sunscreens and it's safe for sensitive skin. I bought the face one for me and the baby one for the kids. The baby bottle turns pink in UV light (the face one turns blue) which is something that I was kind of like, "....why?" but then I'd take the bottle out of my bag and it would IMMEDIATELY turn pink and I felt like it gave me a sense of urgency for putting sunscreen on the baby. It was a really effective reminder that I needed to put sunscreen on her NOW instead of in 20 minutes after I've unpacked everything and gotten settled. Best of all, my super crazy fair little baby did not get even the tiniest bit pink. I am a fan for life. 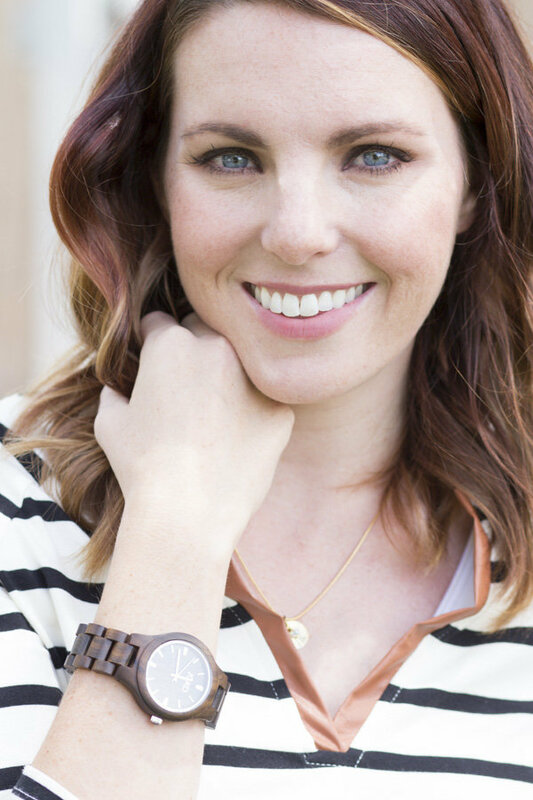 I contacted Blue Lizard and let them know how much I LOVE their product and that I would be writing about it and they very generously offered a coupon code for Freckles in April readers! Use the code P20FIA for 20% off orders over $35 (expires 8/31/15). The last time we went to the Bahamas in 2008 we lugged along our Canon Rebel and a couple lenses. There was NO WAY I was doing that this time! My phone is my camera and that's all I wanted to bring with me. The only problem was that I really needed some kind of water- and sand-proof case so I wasn't constantly worrying about ruining my newish iPhone 6. I found this Joto bag on Amazon a few weeks ago. The reviews were promising so I snagged one. It performed perfectly and everyone else commented that they wished they had one. I took my phone in the ocean, on water slides, into pools. Zero leakage and I got a lot of awesome pictures. 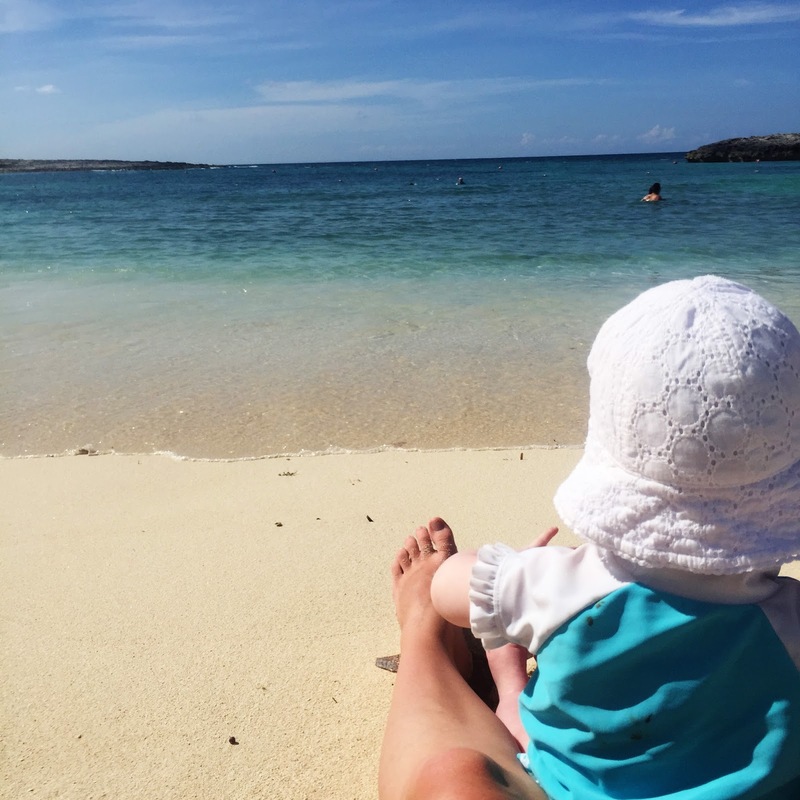 Disposable swim diapers are so. freaking. expensive. 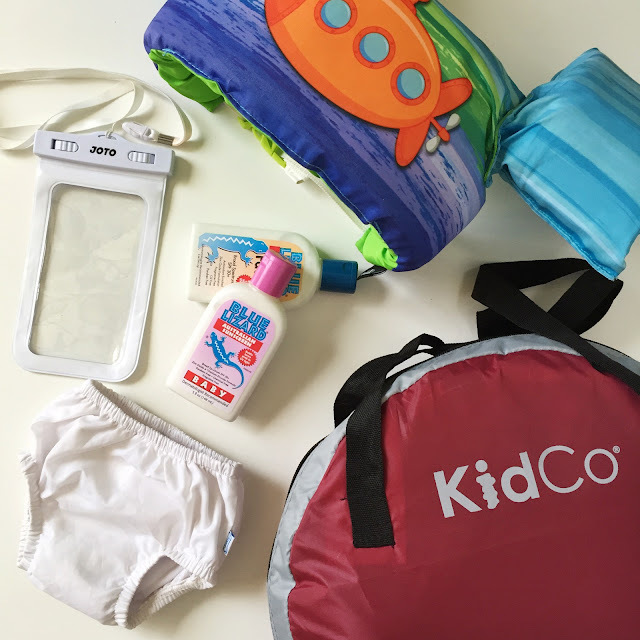 If you swim a lot (we do) then it's worth it to just buy a reusable diaper or two. The Caboose still takes 3ish naps a day but also really struggles to fall asleep anywhere but her bed. I started putting her down for occasional naps in this PeaPod tent the month before we left so she was comfortable falling asleep in it while we were traveling. It folds up pretty small and fits in the outer pocket of my suitcase. Expanded, it fit in the hotel closet so she could have a nice, dark place to sleep with a bit of a sound buffer. We stayed in the condos at Harborside, which was awesome except for it's not particularly close to the waterpark or the beach so going back to the room for naps 3 times a day wasn't really feasible. I took the PeaPod with us and she was able to sleep wherever we were playing. It's got great airflow and she was totally comfortable in the shade. 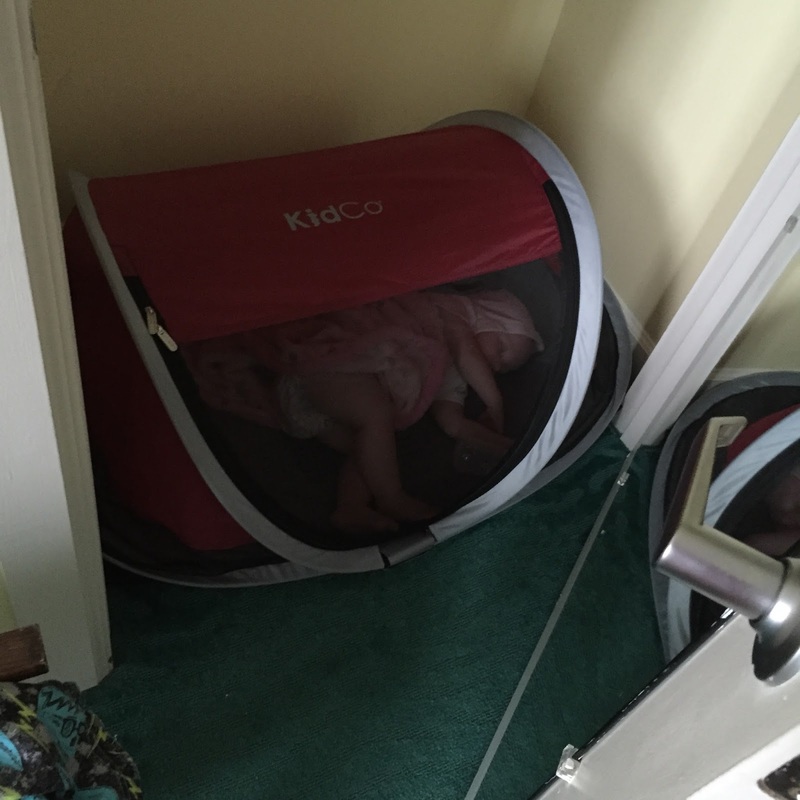 SO much easier than a pack-n-play! 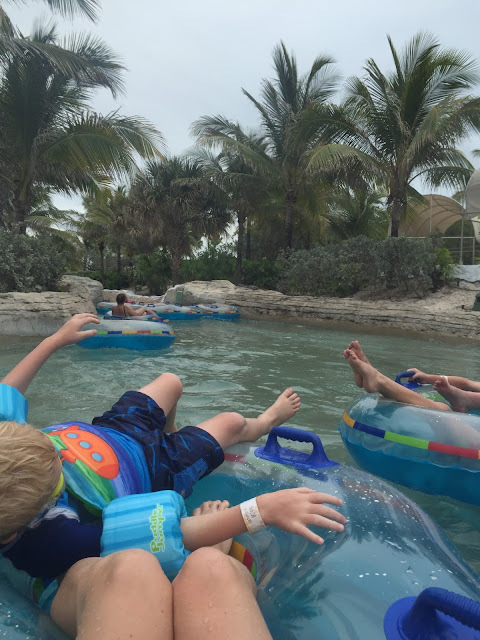 Do you have any tried-and-true must haves for kids on vacation? What makes your life easier when traveling? 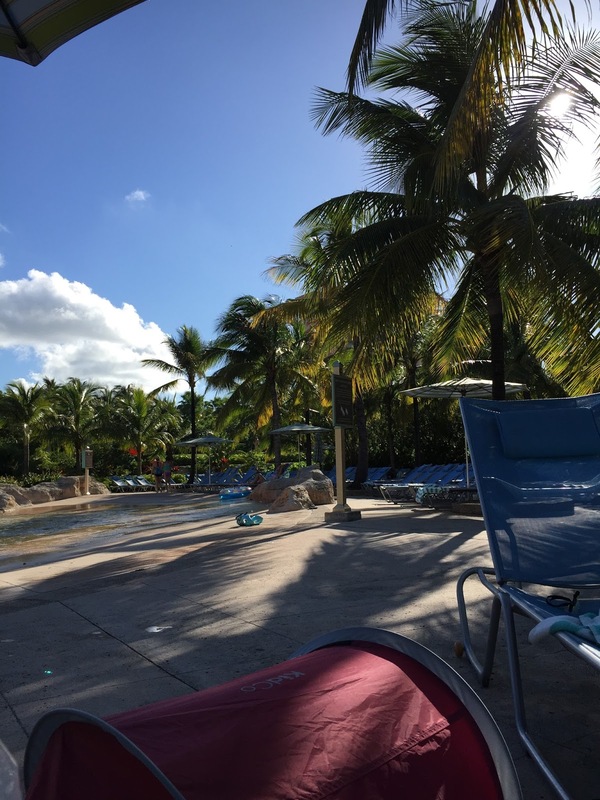 I have returned and I am here to report on how my swimsuits performed at the pools and beaches of the Bahamas! Overall I love this suit but wanted to discuss the pros and cons because I know a lot of people were intrigued by the neoprene suit idea. One of the things I loved is that it totally acts like a wetsuit. You know that awful moment when chilly water hits that one spot on your belly and you want to die a little bit? Doesn't happen in this suit! You're all insulated! 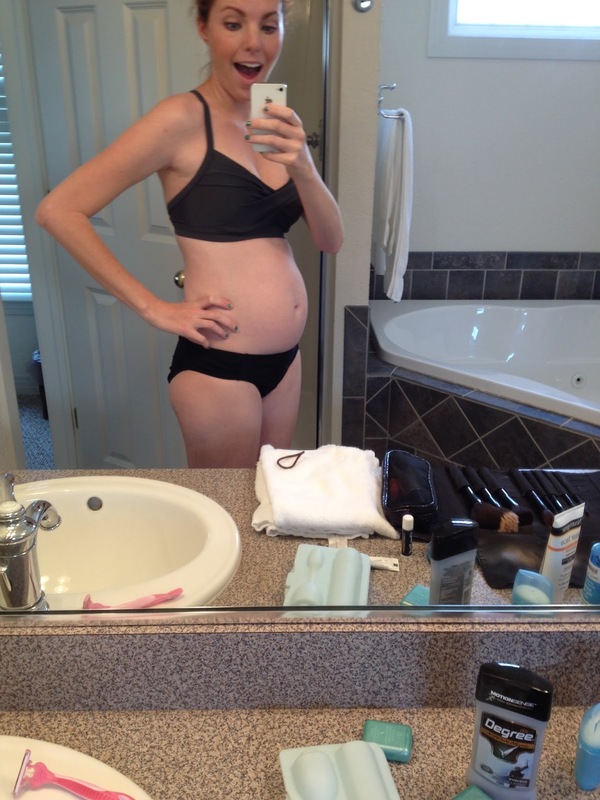 Also, it's quite spanxy and I felt like it was pretty flattering to my post partum lumps and bumps. The one downside is that water doesn't flow through the suit very well, which means that the cutout becomes a bit dangerous. I tried swimming a few laps in my parents pool before we left and the water tugged hard on the top of my suit. I had to adjust frequently to make sure I didn't flash anyone! It was much less of a problem when I was just floating in the ocean and going down water slides but it's something to be aware of if you're actively swimming or diving in. Also, it meant that any water that got into my suit didn't really want to get back OUT again. When I got out of the water I always had to pretend like I was adjusting the leg so accumulated water could pour out. I kind of wonder if sizing down would have helped with that though. I was in-between sizes and went up instead of down. A tighter fit might have helped prevent me from turning into a walking water balloon. Overall, though, I thought it was a totally worthwhile purchase. Yup, right after posting about it I went out and bought one. I didn't have time to order it so I scoured two local stores the day before we left and finally found one in my size. Or...what I THOUGHT was my size. I bought it and tried it on at home. It fit...mostly. It was a little big in the bust but that's kind of normal for me so I ignored it. When I finally got it in the water, though, it became apparent that I should have sized down. Despite the fact that it was a smidge too big, I'm actually a HUGE fan of this suit. Somehow it didn't make it into any pictures but it's super flattering and comfortable. I'm passing this one along to my sister who JUST had a baby because I think it'll be fantastic for her this summer. I've had this rashguard top for years and it's starting to show its age just a bit (especially after I crammed my huge belly into it last summer) but I'm making it last through one more summer. It's fantastic. I wear a cheap bikini top underneath (not pictured) and it keeps my shoulders protected from the sun. I know not everyone is comfortable in bikinis but I really love this one. It's SUPER secure and I feel like I can jump and swim and play in the water with my kids without even the slightest possibility of flashing too much of my upper bits. I was a bit wobbly in the belly area but eh. I did a body slide race with Stinky and it didn't even budge. 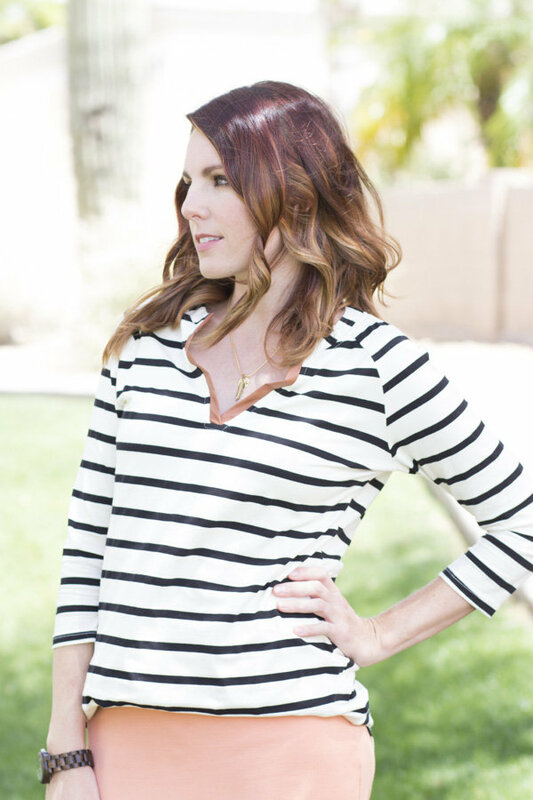 It's a fantastic top and I think you can generally trust Athleta's suits to stay put. One suit I ordered that didn't ship in time for my trip was this tankini from Lime Ricki. You guys, it is so. flipping. cute. in person and the only decent tankini I've seen so far this year since one pieces are having a moment and that seems to be where companies are focusing their design talent. 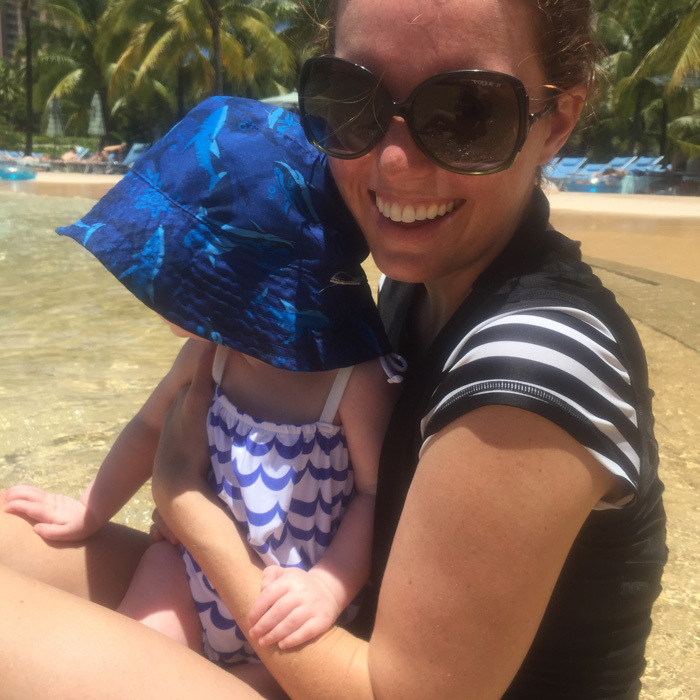 I'm a huge tankini fan (all the coverage of a one piece with the bathroom convenience of a bikini) but I had worn my old ones to shreds. I haven't worn it in the water yet but it fits well and I love the look! 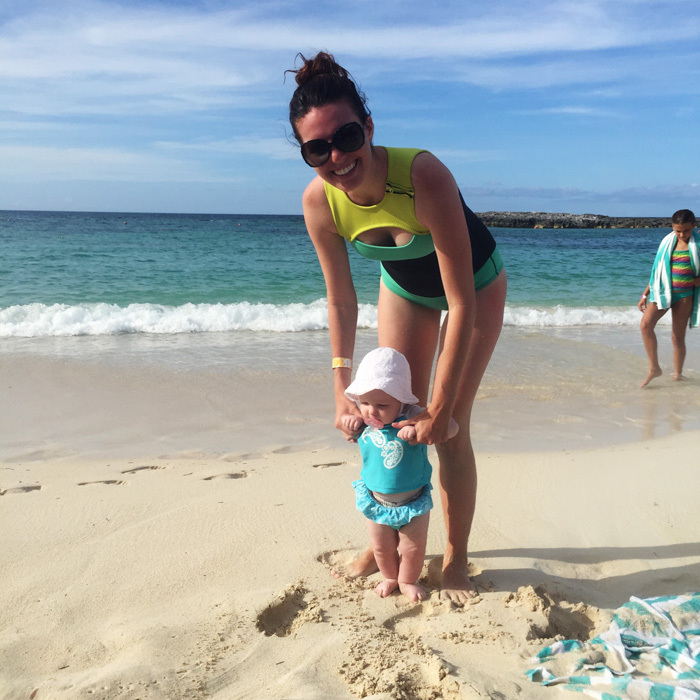 What are your fav swimsuits to take on vacation? 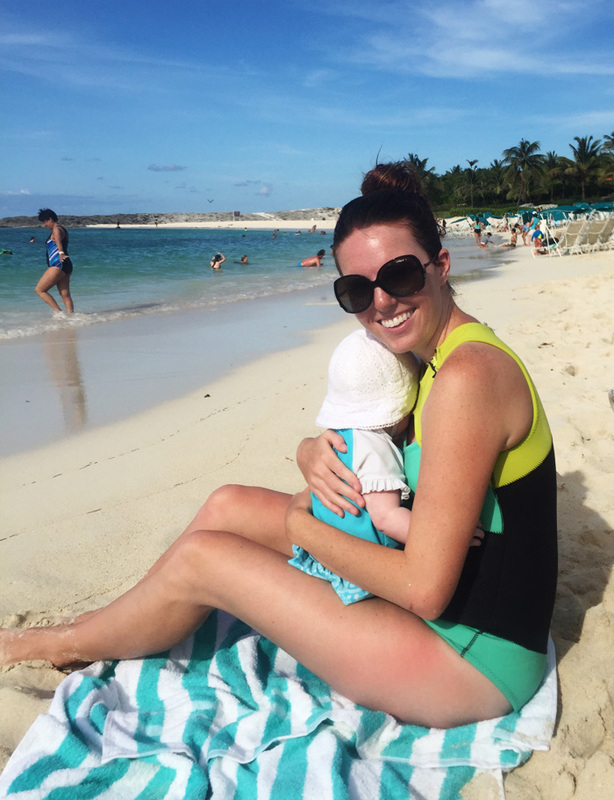 Do you go for beauty or function or have you found a magical swimsuit that covers both? 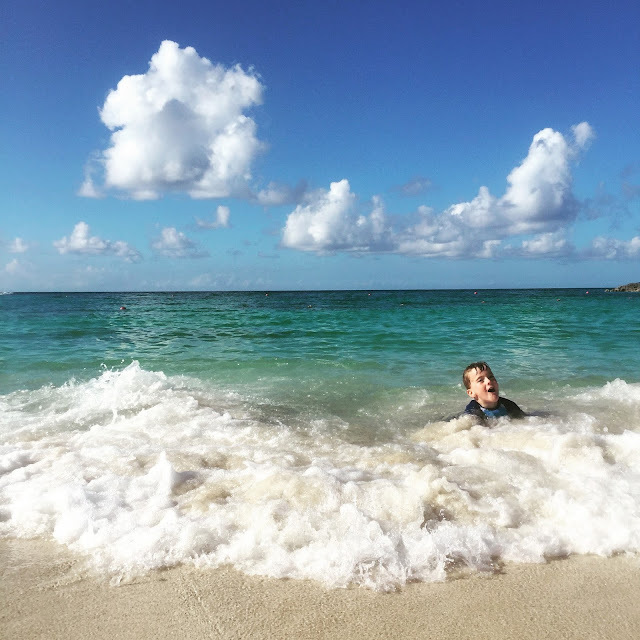 As much as we try to engage our kids in tech-free entertainment while traveling it's sort of inevitable that there will be at least SOME screen and device time! We try, as much as possible, to be smart about it and limit the element of mindlessness. 1. Movies | Ok, I will confess right now that we WILL let our kids zone out in front of movies. Our van has a DVD system so we will for sure be turning on some movies during our road trip. Probably Big Hero 6 over and over and over (Baby 2 insists I'm his Baymax, which melts my cold heart on about 8 different levels).... Also, I highly recommend cordless headphones. Those things have been lifesavers for when Aaron and I just need some quiet. 2. 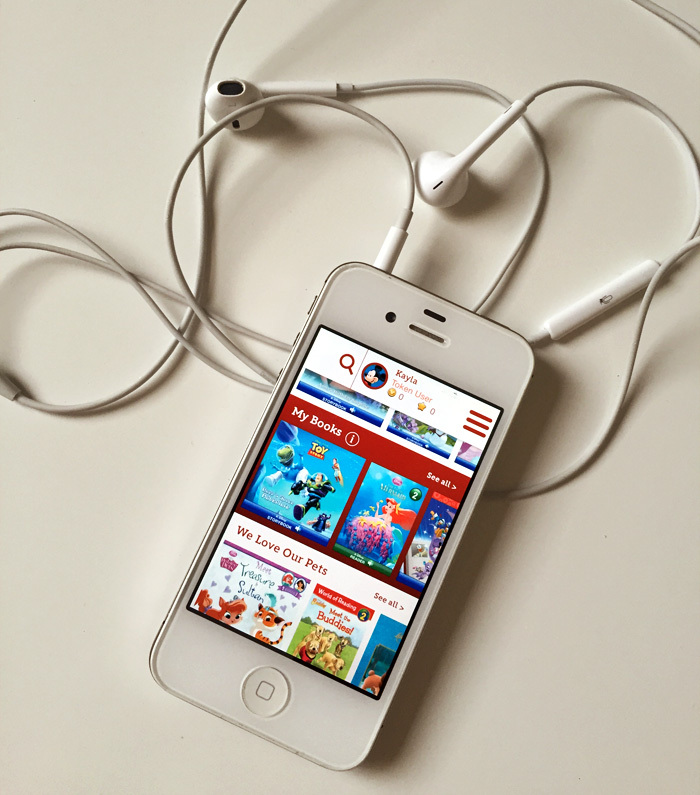 Audiobooks | I dug up my old iPhone 4s and turned it into the "kids' phone". I downloaded a handful of audiobooks from our library through Overdrive (Janssen put together a really great tutorial on how to use the app if you're unfamiliar with it). They listened to The Incredible Journey of Edward Tulane on the plane to the Bahamas. Audiobooks are fantastic for kiddos who get carsick- it keeps them entertained while they look out the windows! 3. YouTube Tutorials | My boys spend a ton of time on YouTube looking up tutorials for the Rainbow Loom, Rubik's Cube, and other fun stuff. As long as we've got service or wifi and a few scraps of paper, they can happily make some crazy intense paper airplanes. I like that there's an element of doing attached to it. 4. 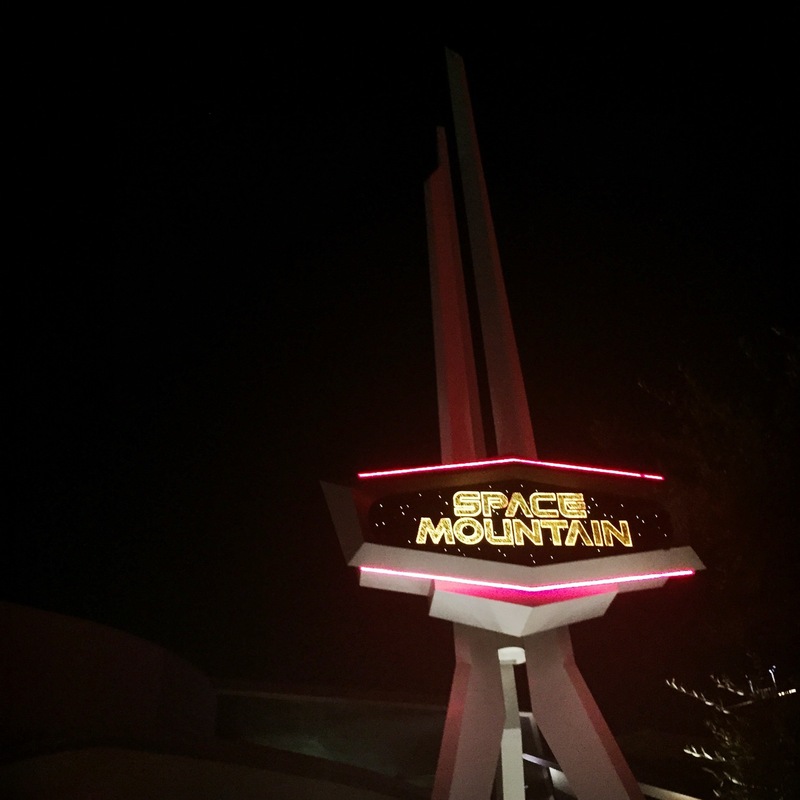 Disney Story Central | We are big on reading with our kids but it's a little hard to do while I'm driving or flying (plus I get crazy motion sickness and can't look at a page longer than .3 seconds). Disney Story Central is designed to encourage kids to develop a lifetime love of reading and they've got a huge library of Disney digital stories that feature my kids' favorite characters like Lightning McQueen, Baymax, and Phineas and Ferb. I got 10 Disney Book Tokens and let each of my boys pick out 5 books for our summer travels but you can also get an annual subscription with unlimited book access. Stinky is a great reader so he picked out some more advanced options but Baby 2 is still learning and preferred the easier books and the "Read to Me" button. The app highlights the words as it reads aloud and he was super proud when there were words he recognized! You can even participate in Disney Story Central's 'Mid-Summer Light Reads’ Campaign – promoting weekly Disney reading themes — for a chance to unlock free books and enter the sweepstakes! Launching on June 11, the campaign will run through August 13. 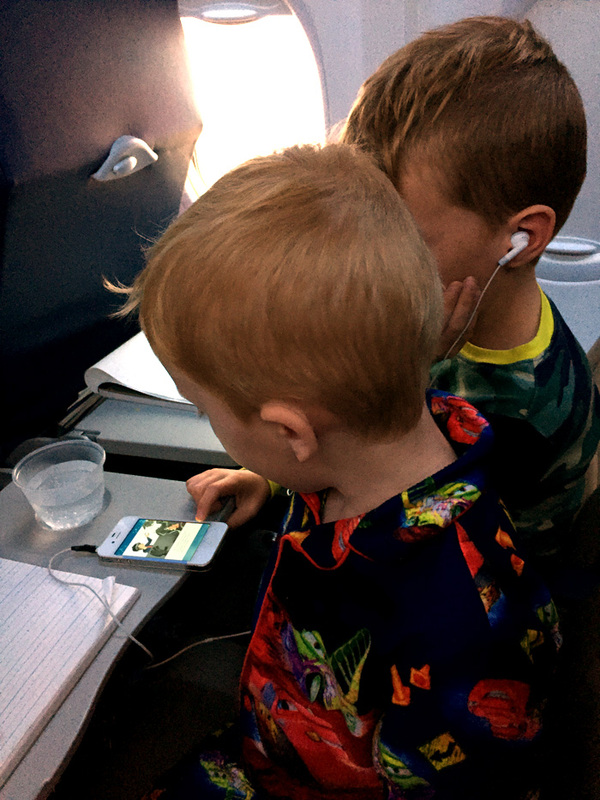 What are your favorite tech-based ways to entertain your kids while traveling? Fav (preferably educational-ish) apps? We're in the market for some math-type ones! We are traveling a LOT this summer. I actually counted the days my kids are out of school and the days we will be traveling and we are gone 45% of the time. Normally we're pretty lucky if we have a couple weekend getaways the whole summer! Our trips include a LOT of travel time. 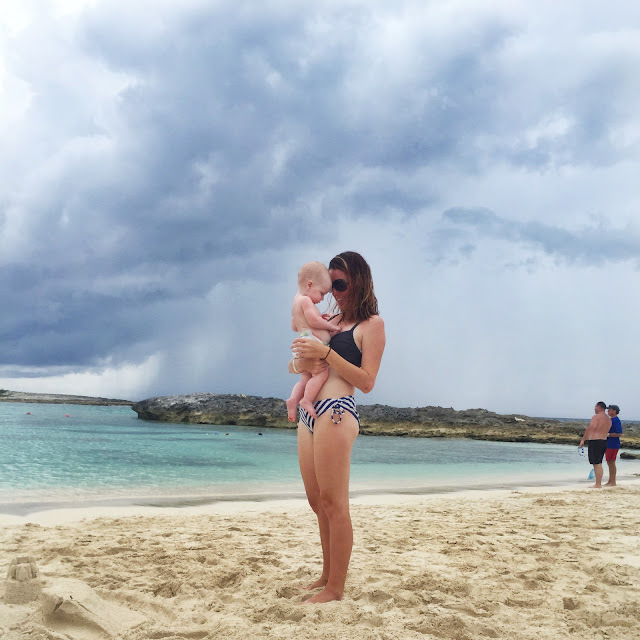 Last week we spent 14+ hours on planes getting to and from the Bahamas and in July we are taking a 3 week road trip which includes daily drives of 1-6 hours. Figuring out how to entertain my kids while traveling has been on my mind a bit (understatement). 1. Story drawing pads, fresh colored pencils and a pencil sharpener | Stinky got one of these a while back from the grandparents and it has been SO fantastic for writing practice that I bought two more for our trips this summer. 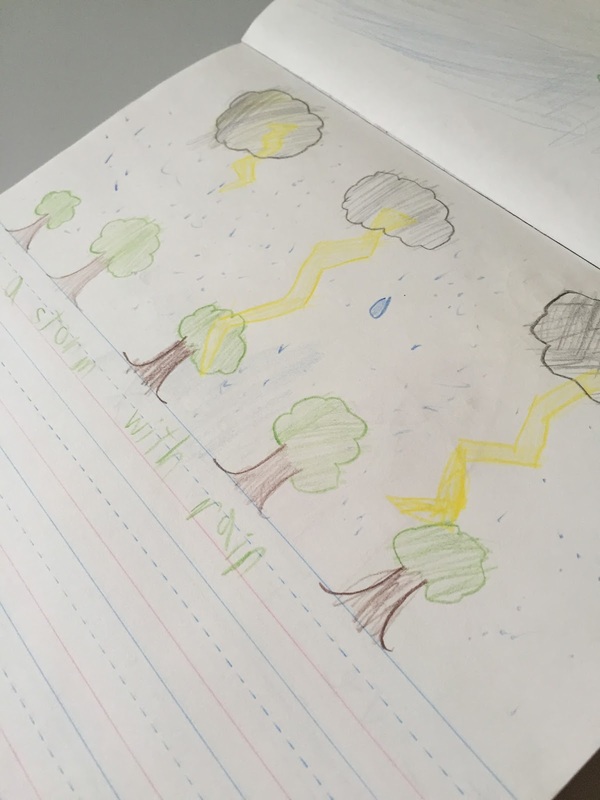 There's a space at the top for drawing a picture then lines below for writing about the picture. Stinky (who is going into 2nd grade) can write his own creative sentences about his pictures. Baby 2 (going into kindergarten this year) asks for help spelling a lot of words but he's getting pretty good at sounding things out and I've been impressed at his sentences as well. 2. Rubik's Cube | This was THE hot toy on Stinky's bus toward the end of the year and he finally saved enough money to buy one. Both my boys loooove this thing and it keeps them happy for hours. We've watched a few YouTube videos to give them some basic skills and now they can each solve single sides (we're working up to the full cube). 3. 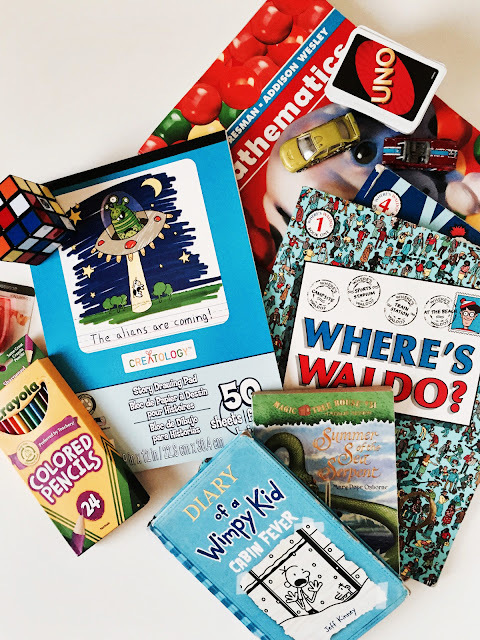 Library books | Where's Waldo? is great for both boys (our library also had a Lego version the last time we went and that was a hit at our house for over a week). Stinky is really into the Diary of a Wimpy Kid and Magic Tree House books. 4. Math books | I'm really trying to help them keep their skills sharp over the summer so we brought along two math books. Ours were ones that Stinky got in K and 1st grades (Baby 2 can do most of the kindergarten one, which sort of surprised me) but we've also got Bedtime Math and some Brain Quest stuff, both of which are awesome. 5. Toy cars | For my boys toy cars are a recipe for at least an hour of entertainment. Especially if they've got books they can make ramps out of. 6. Uno | This is such a fantastic game- it's easy enough for my kids to play on their own but it's still fun for adults so Aaron and I don't usually mind joining in for a couple rounds if we're not otherwise engaged. I'd like to give an honorable mention to the Rainbow Loom. Stinky freaking loves his Rainbow Loom that he got for Christmas a couple years ago and he keeps wanting to bring it along but we don't have a good organizational system (all his bands are just in an open bin right now and I had visions of them scattering EVERYWHERE on the plane or in the car). If you're willing to shell out for one of those fancy storage containers then I think this could also be a good one! 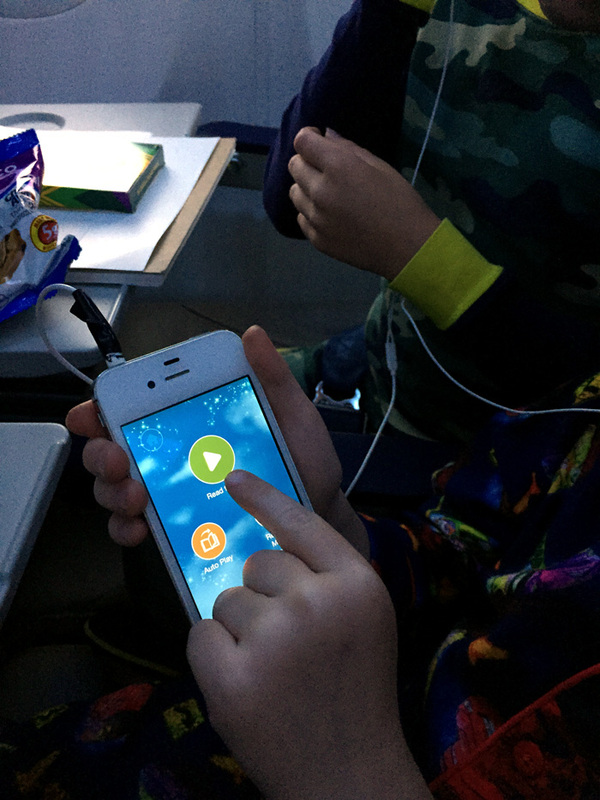 What are you fav tech-free ways to keep your kids entertained on long trips? I'm especially interested in car-friendly ideas! HUGE thanks to Lydia of Photography Hill for taking my pictures. 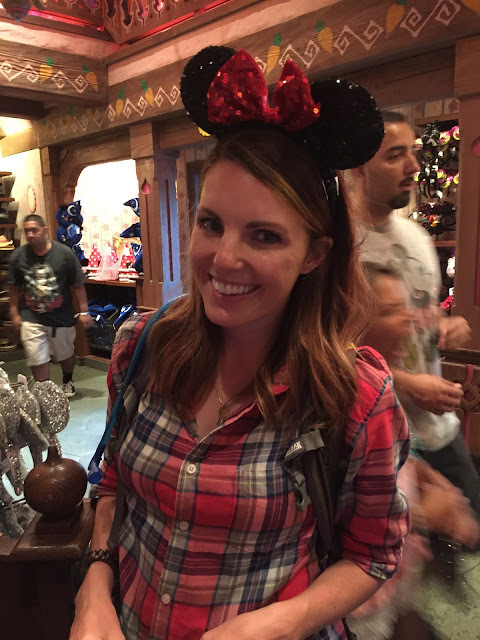 If you're a Phoenix-based blogger you really need to look into her blogger services. It's AMAZING having someone else around to take your pictures! Stripes? Check. Tube skirt? Check. Chunky watch? Check. Delicate gold jewelry? Check. 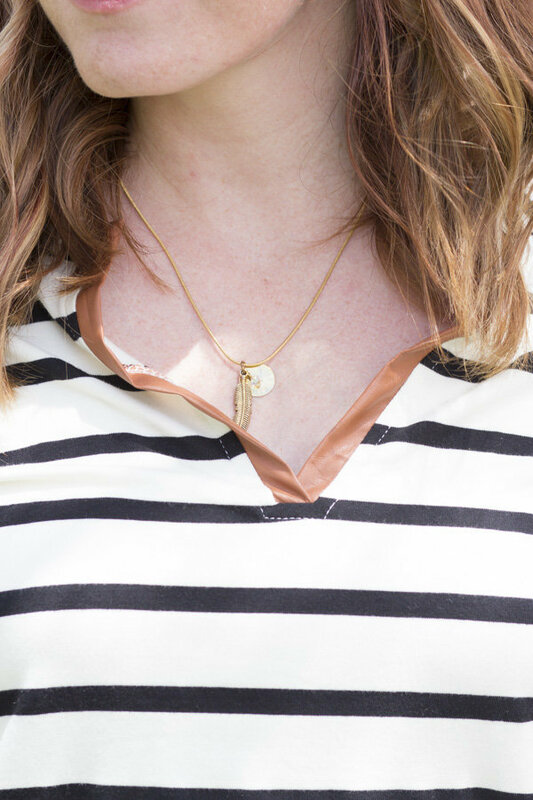 All of my favorite things rolled into one outfit (that I wore to 3 different events in one week because why not?). My sweet friend Crystal recently started making and selling stamped jewelry and she gave me an initial pendant for my birthday last month. I LOVE it and it has become the necklace I reach for most days! 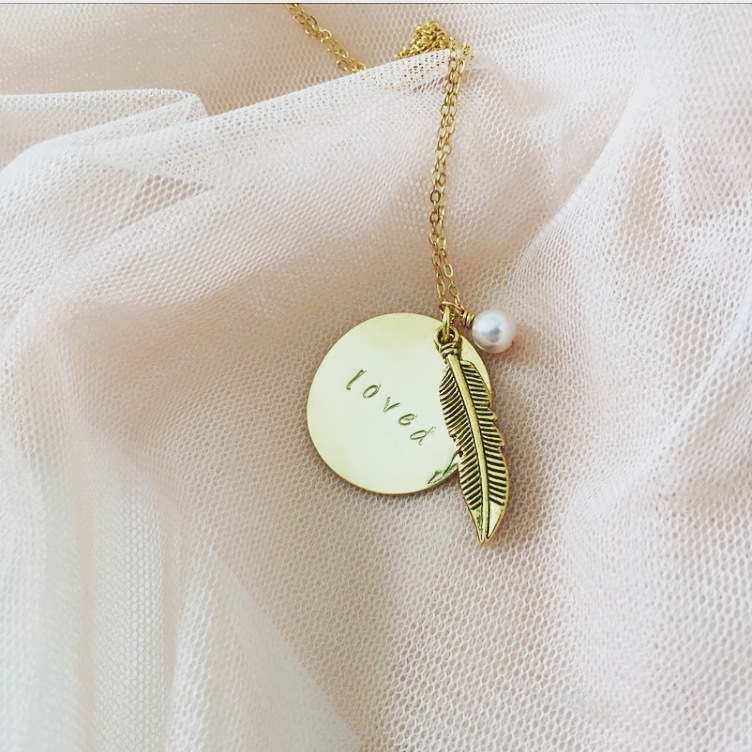 Because I love you and want you to have nice things, I'm giving away a C Davis Designs "Loved" stamped necklace to one of my readers! Use the Rafflecopter widget to enter. I'll pick a winner on June 13. Good luck!! A few weeks ago I posted about my newfound love of podcasts and got the most comments I've gotten on a post in a loooong time. You guys love podcasts too, which just goes to show that you are all my people and we should hang out. If you were a fan of Serial you neeeeed to start listening to Undisclosed. At first you'll be like, "Wow, we're still talking about this?" But then they start throwing stuff at you and your mind will be blown and you'll probably feel pretty confident as far as whether or not Adnan is guilty. 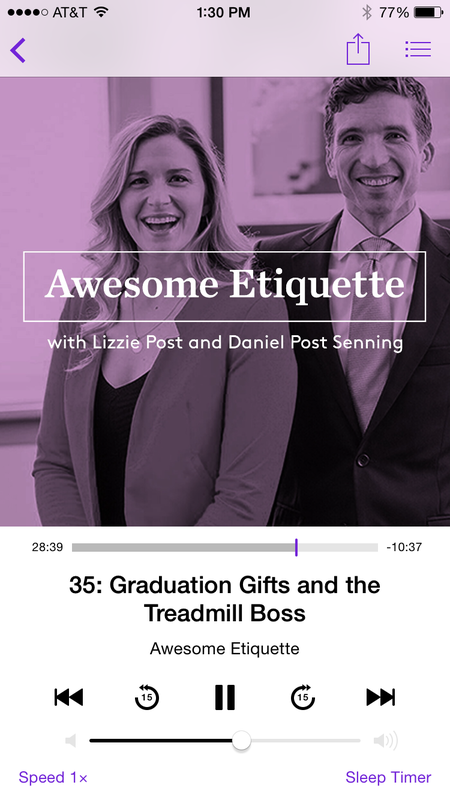 I've also discovered Awesome Etiquette (by two of Emily Post's descendants). We love discussing etiquette at our house (note that this does NOT mean we are particularly polite. Four out of five members of this family have farted at the dinner table in the past month) and I sent an email a couple weeks ago that they ended up reading on a recent episode. I made it onto a podcast! All my dreams! Episode 35, about 12ish minutes from the end if you're interested. This is posting while I'm in the Bahamas so hopefully my darling children will have let me knock out a few more from the above list during our 7+ hours of flight time! Every once in a while I participate in the Wednesday #altchat on Twitter. Last Wednesday they posted this quote and asked the question, "What is your definition of success? How do you measure it?" It's kind of rare that a Twitter chat provokes much navel-gazing but I've been thinking about it ever since. In terms of my blog, I've always measured my success in terms of numbers and growth because that just seems logical. But, the thing is, my blog hasn't grown in over two years (I pulled up my media kit from 2 years ago and I could still use it today. My numbers are almost exactly the same). So, by that measure, I am actually unsuccessful. But over the past two years I've posted a lot of content that I'm proud of. 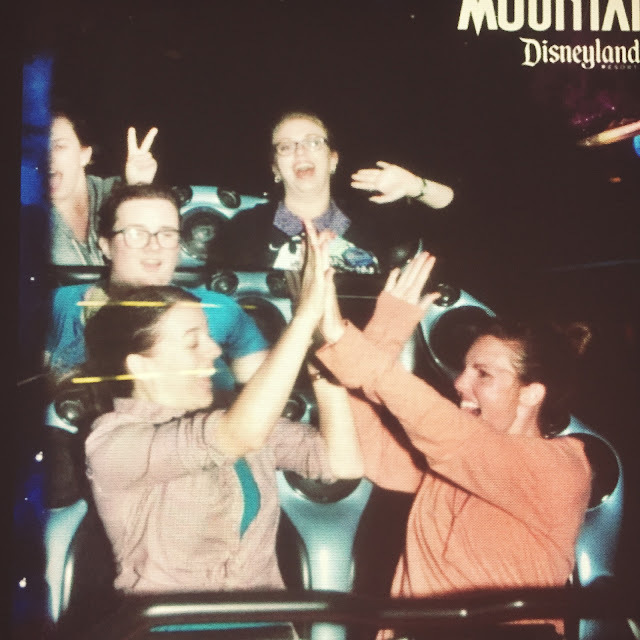 I've made and deepened friendships within my blogging community. I've contributed to other blogs and websites. I don't feel unsuccessful unless I start thinking in terms of numbers. As I thought about this I realized that I get to define what success means for me not just in blogging but in all areas of my life and I was a little surprised when I realized WHAT, exactly, makes me feel successful. As the general manager of our household I've realized that I feel the most successful when I look back at my day and I've used my time wisely and gotten a lot accomplished. The most important thing, though, is going to bed with a clean kitchen. I feel like I have failed at life if my kitchen is a wreck when I go to bed. Unplugging and staying away from my phone and computer makes me feel super successful, even if I haven't really accomplished anything else. How do you define success for yourself? When do you feel the most successful?